Type of Wizardry (If any): Speed and Lightning Magic. Guild (If any): Fairy Tail. 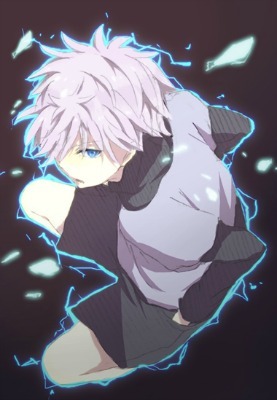 Personality: Killua and Kores are both cold to outsiders. They are quiet and generally never speak to anyone but each other. However when speaking to others they speak at the same time just to annoy people. They are generally callous and cold hearted not really caring for heartbreak. However Killua and Kores both care deeply about each other and will kill for each their guild. As assassins they don't feel remorse at all. However Killua is the more open and talkative of the brothers. Kores is a stoic silent guy and is mostly a listener. He is somewhat more intelligent than Killua in historic manners but Killua has more street smarts. In addition Kores is the leader of the two and Killua follows without question. Likes: Assassination, Money, Candy, Training, Martial Arts. Dislikes: Peace(it means they don't eat) Rivalry, Poverty, Dirt, Bugs. Electricity: Each of them can run a live electric current through their body that is capable of being sent out in bolts or harnessed for melee attacks. Speed Magic: As per usual Speed magic lets them simply use flash step movements to attack their opponents. However they also use it to increase the speed of their limbs when fighting. Neuroshock: They can eliminate their control and fight simply using their reflexes. This is dangerous and they usually only do it one at a time. Physical State: They are also both at top physical condition. They have amazing stamina and endurance although kores is slightly faster than Killua.